Large, backlit screen 30-model internal memory Airplane, helicopter and glider program options SD card slot for data sharing, storage and updates (SD card required) Li-Fe 6.4V, 1400mAh 2S transmitter battery pack Integrated charging circuit 9V AC/DC adapter supplied with automatic shutdown Lightweight (770 g) transmitter design Easily adapts to stick modes 1–4 Data entry via scroll bar and four push-button keys Telemetry with receiver voltage sensor built in Optional telemetry sensors available Stick tension and spring adjustment Dual trim options Dual side slide-lever controls Touch Select System for switch selection User-selected menu for frequently used functions 8-channel failsafe User-assigned switch function Programmable throttle cut Two independent programmable timers Overview Using specifically developed JR® DMSS* technology, the all-new XG8 radio system provides a reliable 2.4GHz radio link with the ability to control popular model types within the airplane, helicopter or glider categories. 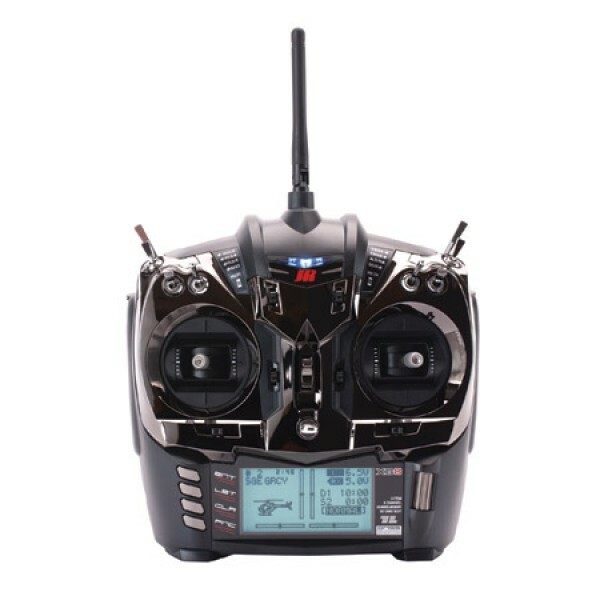 In addition, the XG8 offers an Intelligent Output System for enhanced control accuracy and advanced telemetry functions to display critical flight data when you need it most. The XG8 is the first JR transmitter to come with a Li-Fe battery, which has greatly reduced it weight. Inside the transmitter is an integrated charging circuit that automatically shuts down when the battery reaches full charge. No more worries of overcharging. Programming is easy thanks to the well-proven, intuitive user interface with data entered using the familiar scroll bar and four push-button entry keys. The programming information is clearly displayed on the large, graphical back lit screen. Dual Modulation Spectrum System (DMSS) 2.4GHz protocol offers a secure radio link that combines DSSS and FHSS capabilities into a wideband transmission system and includes high-speed response and high resistance against RF noise. One benefit of DMSS* is the JR Intelligent Output System (IOS), which automatically selects control signals that need to be transmitted at exactly the same time and delivers the data as one complete signal frame. IOS ensures there is no time delay when commanding servos used for critical functions, such as a CCPM swashplate on a helicopter, or when operating a wing control surface with multiple servos. Another feature of DMSS is its bi-directional communication that supplies telemetry information. Receiver voltage telemetry is built in as standard in every DMSS receiver, and add-on sensors will give you real time feedback of information from your model, such as the RPM of an aircraft propeller or helicopter rotor blades, temperature and variometer/altimeter readings. No matter what kind of airplane, helicopter or glider you fly, the XG8 is designed to enhance your control and deliver an evolutionary level of precision that is genuine JR.